I love to bake from scratch so that’s why I’m a little embarrassed to admit that when it comes to brownies I usually make them from a box mix. It just seems so convenient to make them from a box and I don’t normally keep cocoa around. But that was before I made this recipe…now I think I need to stock pile cocoa in my pantry so I can make these whenever I want. I was amazed at how simple these were to make & how delectable they were. The first batch of brownies I made disappeared very quickly and I’ve had several requests to make them again. I can safely say this recipe is now my go-to brownie recipe! The story behind this recipe: I found this recipe at Saltbox House. They are called Lunch Lady Brownies because they really were served in a school cafeteria. 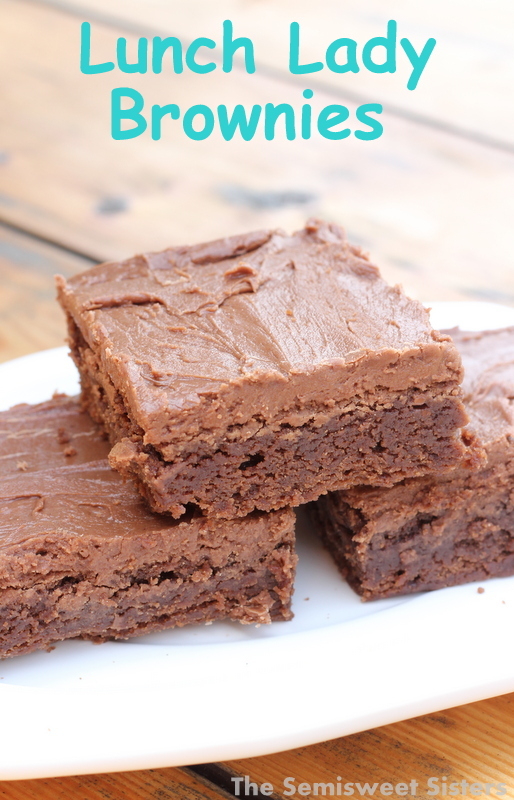 This recipe is over 50 years old & comes from a small town in Idaho where these brownies were made in the cafeteria of Bonneville Jr. High school. Melt butter in microwave (takes about 30 seconds) and pour into a mixing bowl, add cocoa and beat with an electric mixer until smooth. Add flour and sugar and beat together. Add eggs and vanilla (and nuts if your adding them). Mix until just combined. Be careful not to over mix! Pour into greased 9x13 baking pan. *Note* Batter will be thick. I had to use a rubber spatula to spread it into pan. Bake 25-30 minutes or until toothpick inserted in center comes out clean (Mine took 30 minutes, if you live in high altitude these should get done quicker more like 20-25 minutes). Wait only 10-15 minutes to frost brownies, you want to frost them while they are still warm so the brownies can absorb the frosting. To make the Frosting combine the ingredients in a mixing bowl and beat until smooth. nothing like a classic brownie! Brownies are awesome and I always use box mixes too haha. I love the corner pieces though, I need one of those pans that gives you all edge pieces. I made these and they were scrumptious!! OMG…I could taste the ‘homemade’ in them. Awesome recipe! Thanks for sharing!!! Hi Sherri, So glad you liked the recipe. My family loves them too! Thanks for taking the time to comment, we appreciate it! I was very disappointed in this recipe not moist enough. My chocolate sheet cake recipe always turns out . Couldn’t figure out why no buttermilk or any other liquid was in this recipe. Hello MarySue, Sorry to hear that you were disappointed with this recipe. It is hard to compare this brownie recipe to a sheet cake recipe. 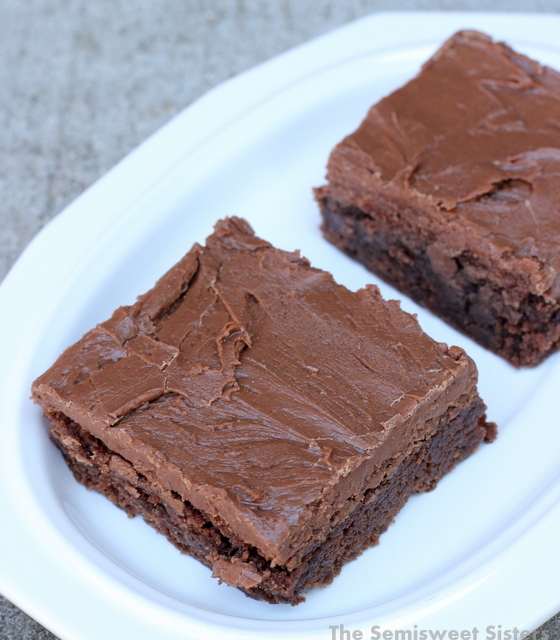 Brownie recipes usually don’t contain milk or buttermilk, all the eggs & butter are supposed to keep it dense and moist. I have had no issues with mine turning out dry, perhaps they were baked for too long which can easily happen with brownies. Thanks for commenting, we appreciate it! Maybe she should have sifted the cocoa powder first. Hi Sam, It sounds like maybe the cocoa powder was bad. I’ve never had that issue before, the powder should not be chunky.